In nature, a seed or nut normally gets enough moisture from rain to wash off the acids and enzyme inhibitors so it can germinate and produce a plant. 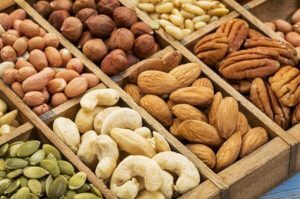 By soaking nuts and seeds before you eat them, you imitate nature by neutralizing these toxic growth inhibitors, releasing the natural enzymes and vitality within them. These enzymes, in turn, increase the vitamin content of your nuts and seeds, especially the B vitamins. Soaking also makes them much easier to digest and enables their many nutrients to be more easily absorbed by your body. By fully sprouting the nut or seed, it transforms from a unit of storage into a growing green plantlet. This enhances its nutrition, but it also greatly changes its taste and texture, and makes it highly perishable, so you always have to use up sprouted nuts and seeds within a few days. In contrast, soaking and then drying nuts and seeds is a long-lost, traditional method of preparation and preservation used worldwide for thousands of years. For example coastal Aztecs (and Central American people today) would soak pumpkin or squash seeds in sea water and then sun-dry them. Using sea salt in your soak water helps de-activate the enzyme inhibitors and makes your nuts and seeds extra tasty. Gently drying them at a low temperature locks in the nutrition and enzymes for months of future use, and preserves the buttery flavor and crispy texture we love so much about eating nuts and seeds. The basic method is to dissolve sea salt in filtered or spring water, pour it over nuts or seeds, using enough of the brine to cover them. Leave them in a warm location for the specified time, then rinse and drain them in a colander and spread them out on your dehydrator sheets. Dehydrate them at 110 degrees F for 12-24 hours (sometimes longer if you soaked them longer), until they are thoroughly dry and crisp. Make sure they are completely dry and crisp. (It’s very hard to over-dry them.) If not, they won’t have that crunchy, yummy texture you expect from nuts and seeds, and they could mold in storage. I like to soak and dry several pounds of nuts and seeds in a big batch to save time and energy when using my dehydrator. I store my dry, crispy nuts in large mason jars in the fridge to keep them fresh for many months. That way, I always have properly prepared nuts and seeds on hand for snacks, salads and recipes. The following info (much of it sourced from Nourishing Traditions) will help you sort it out. 2 hours, if at all12-24 hours at 200-250 degrees. If you want to fully sprout your nuts raw-foodie style, you can use the above soak times as a guideline. After soaking, rinse and drain your nuts/seeds, then and leave them out in a covered bowl or tray to sprout, rinsing them with purified or spring water once a day. Do not dehydrate. 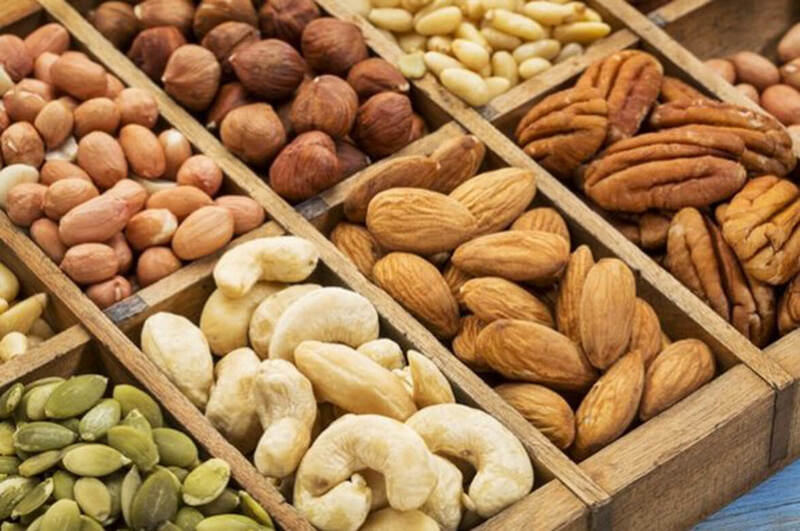 Pecans, walnuts, pine nuts, Brazil nuts, macadamias and pasteurized almonds will NOT sprout, but they still contain phytates and enzyme inhibitors that should be removed by soaking. Only make as many fresh, raw sprouted nuts or seeds as you can eat in 2-3 days. Store them in a jar in the refrigerator. * Truly raw almonds are no longer available commercially in the U.S., though people who live in California can still buy them from the farmer’s market. Since 2007, all U.S. almonds must be “pasteurized,” meaning fumigated with chemicals—or steamed, if organic. To get truly raw almonds with all their enzymes and vitamins intact, you must live in California, get them imported from Spain, or order them online. 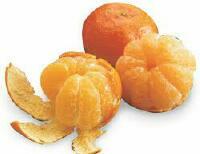 ** Cashews will become slimy and develop a nasty taste if allowed to soak too long or dry out too slowly. Pistachios will also fall apart into mush if soaked too long. This is because cashews and pistachios are not truly raw, but get heated after harvest to extract them from the inedible fruit and skins in which they grow. If you do soak them, and plan to eat them whole, dry cashews and pistachios thoroughly in a 200 to 250 degree oven—the enzymes have already been destroyed during initial processing.